June 3, Spiderman arrived Hong Kong with a call. A call for justice. 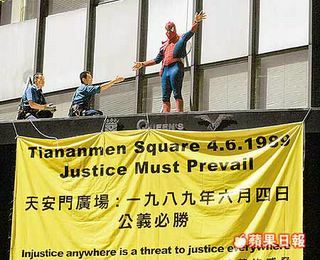 Justice for the victims oof the Tiananmen Massacre in 1989. The spiderman who climbed to the top of the big screen of the commercial building in Central, Hong Kong later was persuaded by the fireman and free. No charge on his action. Tonight, June 4, there will be a vigil night in Victoria Park. The program will commemorate the victims that sacrificed themselves in order to fight for the democracy and end the corruption. For those who are in Hong Kong, you are invited to join the program.